Home › News › World › Where in the World Are the Hottest Social Networking Countries? While several US-based sites like Facebook and Twitter might get most of the publicity, social networking is a worldwide phenomenon that eMarketer predicts will encompass nearly 1.5 billion internet users by the end of this year. As of December 2011, eMarketer estimates, just over 1.2 billion people around the world used social networking sites at least once per month. That represented 23.1% growth over 2010, and double-digit growth will continue throughout eMarketer’s forecast period, though the rate of change will decrease as the market matures. The region with the highest number of social network users is Asia-Pacific, where 615.9 million internet users will log on to social sites by the end of this year. About half of those users will be in China, where social network users will outnumber their counterparts in the US by nearly two to one. China and the US are the top two countries in terms of overall number of users, but the rankings of key social networking countries around the world change when examined based on penetration rates vs. growth rates. In 2012, the US will have the greatest share of social network users as a percentage of the total population (49.9%), followed by Canada (49.3%), South Korea (46.6%), Australia (44.4%) and Russia (41.9%). As a share of internet users in 2012, however, Brazil will come out on top—87.6% of web users in the country will use social networking sites—followed closely by Indonesia at 87.5%. In developing markets like these, fewer people overall are online, but among those who are on the web, social networking is often a key driver of internet usage. The fastest growth in social networking this year, meanwhile, will come from India (where usage will increase by 51.7%), Indonesia (51.6%) and, lagging distantly, China (19.9%). 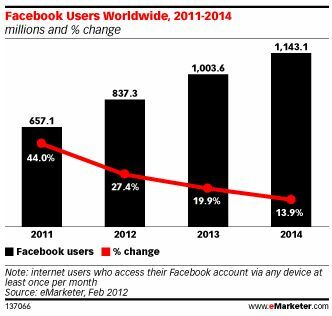 Much of this growth is due to the ever-climbing popularity of Facebook—though notably not in China, where the site is banned. 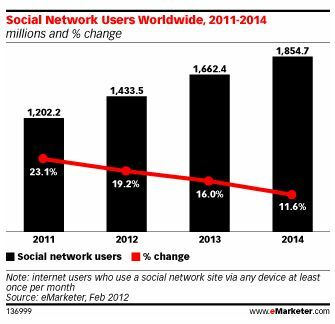 eMarketer estimates the social networking giant will pass the billion-user mark by the end of 2013. 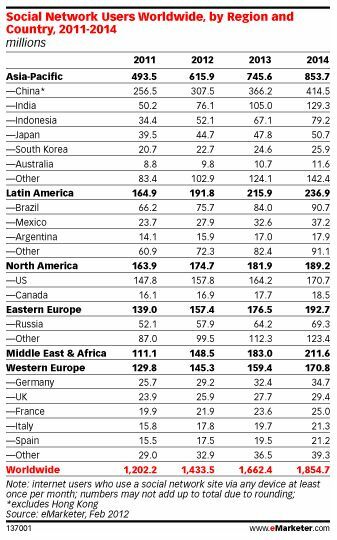 This represents eMarketer’s first worldwide estimates of social network usage and Facebook usage. eMarketer bases its estimates of social network usage on the analysis of survey and traffic data from research firms and regulatory agencies; the growth trajectory of major social network sites; historical trends; internet and mobile adoption trends; and country-specific demographic and socio-economic factors. For Facebook-specific estimates, eMarketer projects based on all of the above as well as Facebook company releases.